As a blogger, you probably work from home developing all your own content, posting to social media, and managing your to-do list. What do you need with networking? Is going to a networking event in your local area really going to help grow your blog? No. But networking online with other bloggers definitely will and that’s the kind of networking we’re going to talk about here. If you’re serious about growing your blog traffic so that you can make a part-time or full-time income from it, then networking is a necessity. Seeking support from other bloggers will not only grow your traffic, it will make you a better blogger. Networking with other bloggers will not only make your blog more successful, it will make you better at what you do and how you do it. You’ll find that support, inspiration, and opportunities are plentiful, and you may even be inspired to create a workshop or write a book that will bring you even more success. Nothing great is ever accomplished alone. With the support and encouragement of those who have already succeeded where you hope to succeed you can go far. It’s been long proven in entrepreneurial success that you are the average of the five people you spend the most time with. By networking with those you have something to learn from, you’ll become better at what you do. It’s nice to have someone who understands your frustrations, gets that blogging can sometimes be lonely, and is excited about your successes. Ready to connect with other female bloggers over40? GO HERE To Join Our Private Facebook Community! No matter how long you’ve been blogging, there’s always someone who’s done something better or gotten more impressive results than you. Finding that good example will always help you learn what you can do better and how. If you’re feeling stuck and don’t know how to do something, ask another blogger. You’ll be amazed at how supportive and helpful other bloggers can be. Join Facebook groups and online forums specifically for bloggers and follow the discussions. No doubt you’ll learn something you didn’t even know you needed to know. Collaborating with other bloggers almost always leads to amazing results. You’ll find ideas, inspiration, and opportunities you would never have found on your own. You’ll be inspired to make positive changes to your blog. You’ll find opportunities for new sponsored posts. And you’ll discover ideas for possible content you’d like to create for your followers. You may even find an opportunity to co-author a book or participate in a forum or workshop. When it comes to growing your blog and creating new content, there’s always something you’re not sure of. What should you charge for a program or eBook? What kind of freebie gets visitors to offer you their email address? What content is most relevant to your readers? 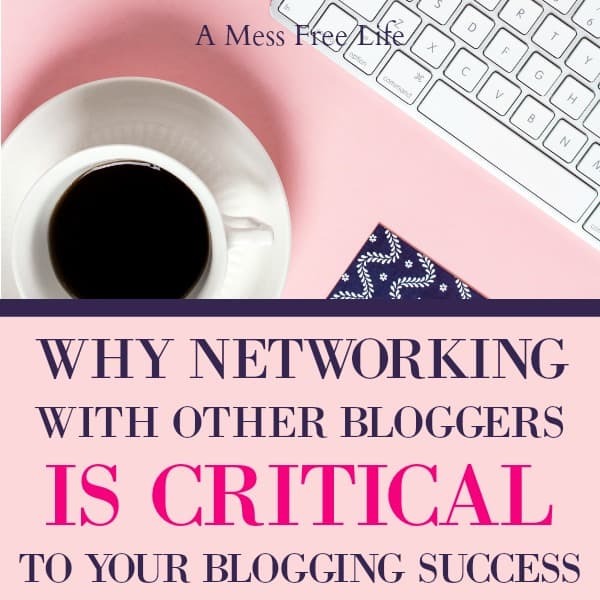 Having a network of like-minded bloggers at your fingertips is an amazing resource for helping you make these important decisions. Bloggers love sharing each other’s content. Especially if that person is also sharing theirs. Having a network of bloggers to share your content with will increase your visibility as they share that content with their own readers. You can even seek contributors to your blog through your network. This will not only provide you with fresh content for your blog, but your contributor is more likely to share something they wrote with their followers. Everyone has a different angle; a different approach to an idea. And everyone has different strengths and weaknesses. You may be able to help someone else out with ideas where you have strength and seek help where you have a weakness. Maybe you’re great at content but don’t understand the first thing about analytics. Or maybe you have technical knowledge but don’t understand the best way to use social media. When you’re part of a blogging network, you can share your strengths with those who need help and find help in the areas you need it most. Doesn’t it feel great to help someone else? Not only help them resolve their problem but to also know that you have the “ability” to solve the problem. Your knowledge is expanding and you now know more than you ever used to and you can share that knowledge with someone who can benefit from it. Helping others give you a sense of satisfaction and pride. Being part of a community who can offer that kind of support and help is inspiring on many levels. Have you ever seen that blank stare someone gives you when you tell them you’re a blogger? They just don’t get it. They don’t know what it means, how hard it is, how lonely it can be, how much time it takes, and how much you have to know and learn to keep growing. It’s such a nice feeling to know that someone, somewhere, understands what you do, why, and how hard it is. Being in a networking group of bloggers is like being in a secret, invitation-only, community of people who “get” each other. Like this article? Here are few other’s you may enjoy! If nothing else, it’s fun to be part of a group who understand and speak each other’s language. Most people look at you cross-eyed if you start talking about “traffic”, “engagement”, or “going viral.” Building relationships with other bloggers online (or offline) is just fun. You can talk about things you can’t talk about with other people. You can relate to each other’s stories. And you can feel like you’re understood. If you stay stuck in your own little world of blogging, it will be very difficult to grow and succeed. You’ll have to work harder and longer than you would with help. That’s why networking is important to your blogging success. It will help you achieve great things in a shorter period of time.